Shiny dark green, tender leaves. Strong Rosemary flavor; herbacious aroma. 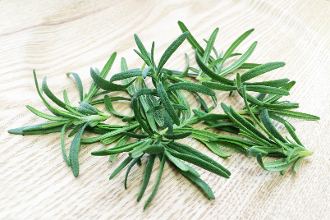 This new form of Rosemary is entirely edible, with no tough stems! Garnish lamb, add flavor to poultry. Add to holiday roasts. Perfect for Fall & Winter dishes.